Below are specific books that I have written. What's a digital presence? How do I get one? Those are the types of questions that Digital Presence for Dummies®, Limelight Networks Special Edition, can help you answer. 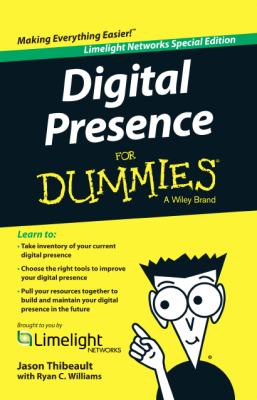 Digital Presence for Dummies, written by Jason Thibeault and brought to you by Limelight Networks, is your one-stop-shop to understanding how important your digital presence is in today's crazy competitive digital economy. And, in fact, it may be suffering from something right now. We call that Digital Presence Deficiency. The book will help you diagnose it, fix it, and even prevent it from happening in the future. And it's funny. Sometimes. Like when we compare your digital presence to a refrigerator. Video. Ugh. The dreaded "V" word. Only you know you need to add more of it to your digital presence. Why? Because video drives conversion. It increases time on page. And, in case you didn't know it, we are actually wired for it. Maybe that explains why everyone is watching videos on every device all the time...Online Video for Dummies helps you navigate the sometimes frustrating world of online video. From how to manage to how to monetize and everything in between, this video will give you all the tools you need to make the most of adding video to your marketing strategy.